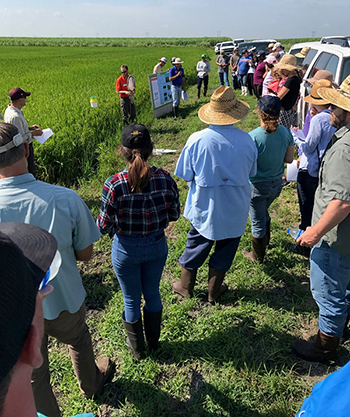 July 26th, 2018 was the second annual Florida Rice Growers Training & Field Day in South Florida. 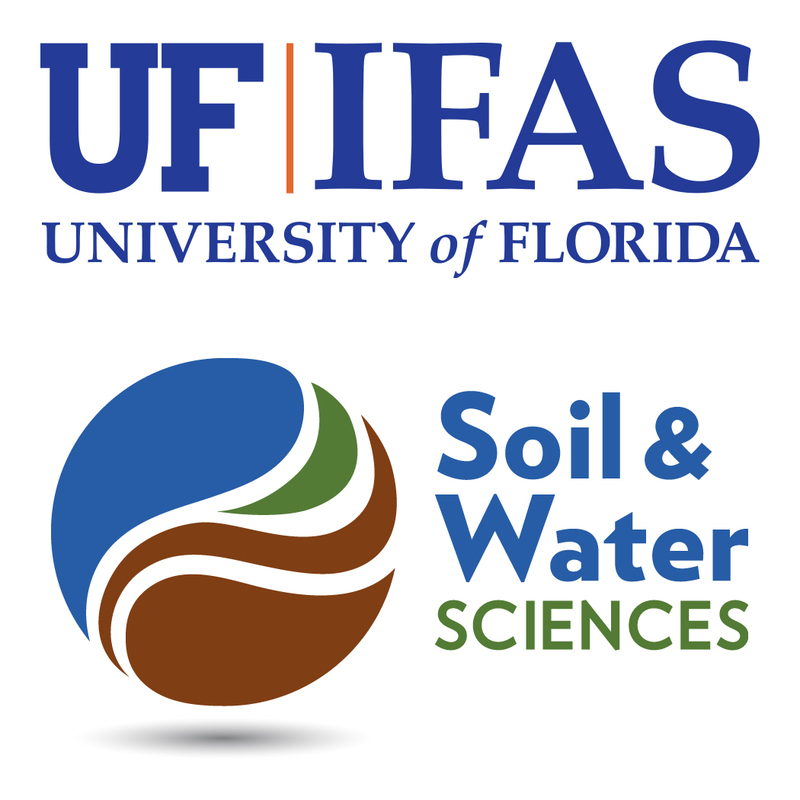 UF/IFAS Palm Beach County extension agent Matthew VanWeelden and I organized the event, which attracted 53 guests, mostly growers and a handful of students who were interested in learning about flooded rice cultivation in the Everglades Agricultural Area (EAA). The day began at 8:30 am; a typical hot and humid south Florida day, perfect rice conditions. A trail of 17 trucks left the Everglades Research and Education Center (EREC) and headed to the first stop, which was a rice field at Wedgworth Farms, where Kayla Thomason (Sugar Cane Growers Co-Operative of Florida) and I made presentations on timing of rice planting, current acreage, harvesting methods, and benefits of growing flooded rice as a rotational crop in the region. Rice has been commercially grown in the EAA since 1977, after it was demonstrated that rice could be successfully grown in rotation with sugarcane during the summer fallow period. The EAA comprises 450,000 acres of Histosols that are devoted to sugarcane production. During the summer period, more than 50,000 acres of fallow sugarcane land is available for rice production. In 2017, approximately 24,000 acres of rice were planted in the EAA. The net value of growing rice in the EAA as a rotation crop far exceeds its monetary return. In addition to being a food crop in Florida, production of flooded rice provides several benefits to the agroecosystem. By flooding fields, growers greatly reduce the negative impacts from issues related to soil subsidence, nutrient depletion, and insect pests. This, in turn, enhances the subsequent sugarcane crop and maximizes the longevity of the soil by reducing soil loss due to oxidation. In addition, incorporating rice as a rotation crop in the EAA during the summer months also provides local employment. 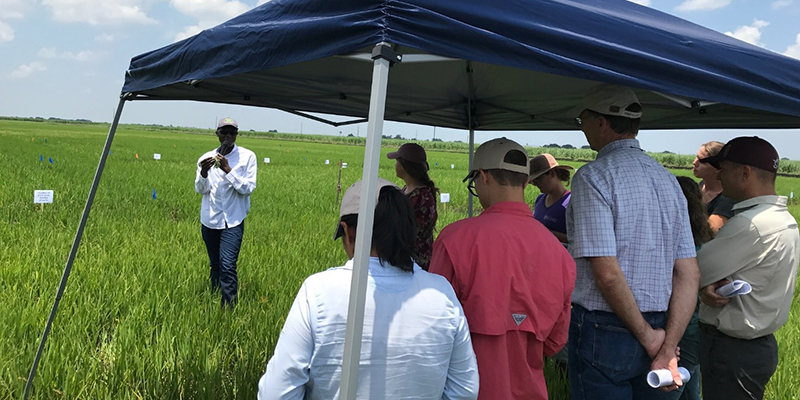 Next stop on the tour was a rice variety trial being conducted near Osceola sugarcane processing plant, where 16 lines of rice varieties were being tested as part of the annual rice variety trial program. Extension agent Matthew VanWeelden and Dr. Julien Beuzelin (Assistant Professor, Entomology) presented their findings and invited the guests to walk into the flooded paddy to visually inspect insect pressure and differences in rice grain quality between varieties. 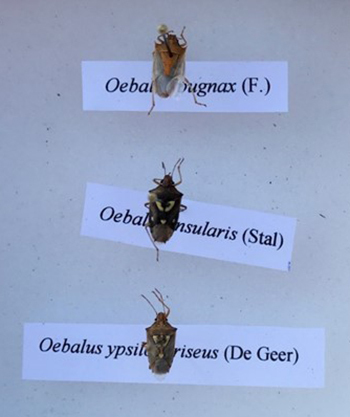 Rice stink bugs (image on right) cause economic losses in two major ways. Both the adult and nymphal stages feed on individual grains of rice as the panicle develops. With their sucking mouthparts, they can completely remove a grain’s content in the milk stage of grain development, thereby reducing yields. More seriously, grains attacked in the dough stage become shriveled kernels with spots varying from light yellow to black. The rice water weevil belongs to the family Curculionidae and feeds on a wide variety of plants belonging to the families Poaceae and Cyperaceae. While this weevil is a major pest of commercial rice, researchers believe its original host to be wild rice, Zizania aquatica L. The rice water weevil is native to the southeastern United States and was introduced into California rice fields in 1958. The pest was first reported in Florida in 1916 and was noted first occurring on rice grown in Florida in 1979. 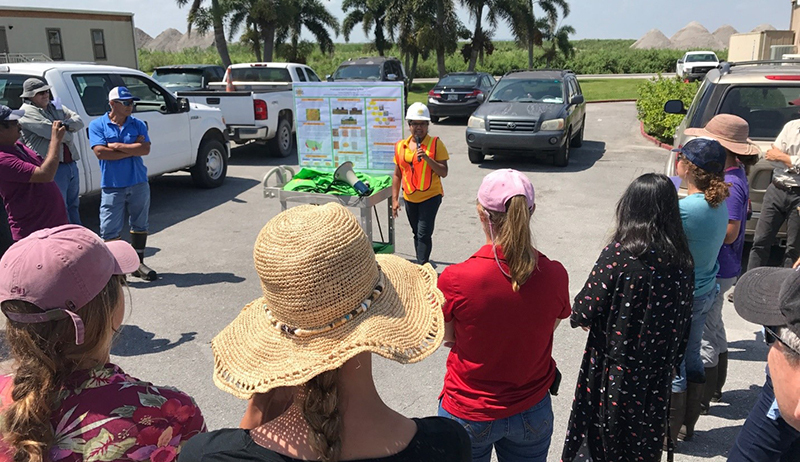 Next stop was Sem Chi rice milling facility where Dr. Sangeeta Mukhopadhyay, Quality Auditor at Florida Crystals Corp., spoke to the guests about post-harvest rice, processing, safety and quality. Rice is very unique in that unlike other cereal grains, rice is mostly consumed as “table rice” which consists of “milled, intact kernels”, thus, the importance of maintaining the physical integrity of rice kernels cannot be undermined. In most markets, broken kernels are valued at only 50% to 60% that of head rice. Because of the economic importance of head rice relative to broken kernels, the broad objective in rice post-harvest processing and management operations, which include drying, tempering, storage and milling, is to maximize head rice yield. 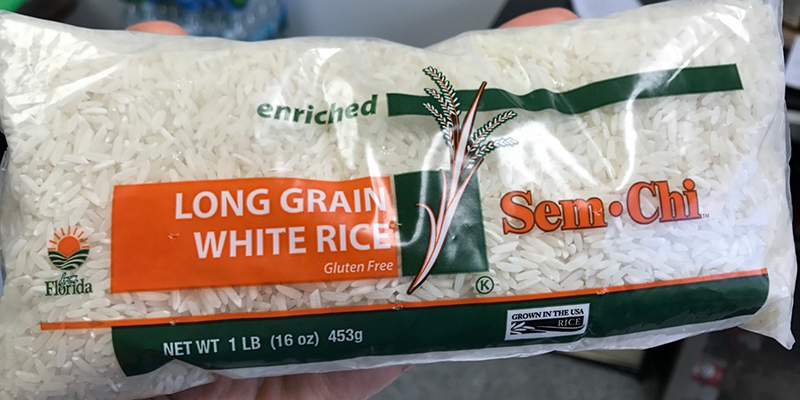 Although broken kernels of rice have been typically underutilized in the rice industry, in recent years the demand for rice brokens has increased considerably. Most of this demand has been due to the increasing number of people being diagnosed with Celiac disease, an auto-immune, genetic disorder of the small intestine, wherein the only treatment for this disease is strict adherence to a gluten-free diet. Rice is naturally gluten-free as well as hypoallergenic, thus, rice is ideal for inclusion in gluten-free diets/formulations. By noon folks were ready to hop back on to their 4 by 4s and head back to the EREC for lunch and open discussions sponsored by Florida Rice Growers Inc. The final stop on the agenda was to visit experimental rice fields at EREC evaluating various modes of controlling weeds in rice. Dr. Calvin Odero (Associate Professor, Agronomy) provided useful information to the guests about the types of weeds that can be encountered in rice fields, and how they can be managed. Types and timing of herbicides was the focal point of the discussions. All in all it was a fun event, and we all left with a pound of local enriched long grain white rice. Hope you can join us next year on this tour. 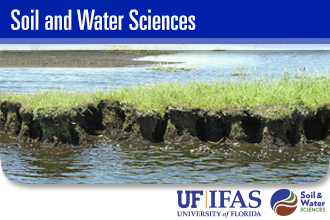 For more information about rice cultivation in the EAA, contact me at jango@ufl.edu. The Soil and Water Sciences Department discovers and disseminates scientific knowledge related to soil, water and environmental science in urban, agricultural and natural ecosystems.